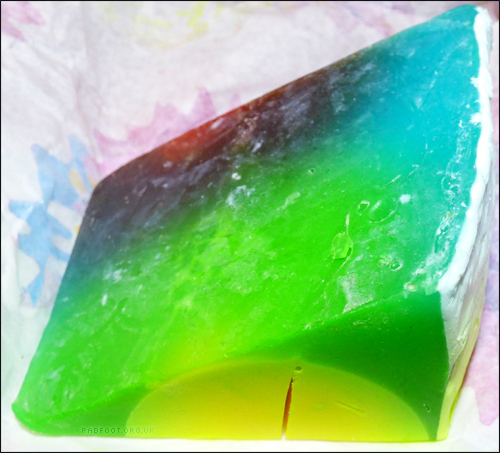 Another soap from the Christmas 2015 range, Baked Alaska was particularly eyecatching cut open in the store, with its frosted white exterior hiding a vibrant multicoloured interior. 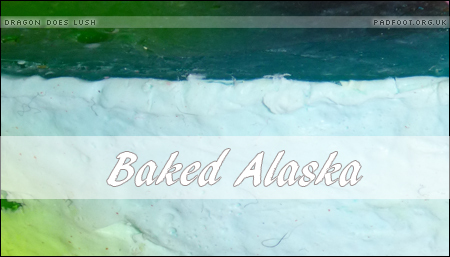 Baked Alaska has a very strong lemony aroma, which is suitably refreshing to use as a bath soap – I think it would be a bit too overpowering as a hand soap, unless you wanted to lose the smell of onions or something similar from your skin! It lathers up easily and although the soap itself has a very strong aroma, which intensifies when used in a hot steamy bath, the lemon scent doesn’t linger on your skin like a perfume, which is a welcome surprise. I purchased my block of Baked Alaska soap in the Boxing Day sale, but I’m hoping it will return for 2016. This entry was posted in Soap and tagged Christmas 2015, lemon scent on April 28, 2016 by Dragon.